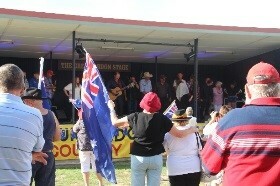 Visitors and locals were treated to a fantastic weekend of Australian Country Music at this year’s Bungendore Country Music Muster. It was a great weekend and the Muster committee would like to thank its loyal sponsors, the many volunteers who worked to bring the muster to life and the Bungendore township who supported the event. As in previous years the committee is very proud to donate money raised by the muster to the local community and organisations including the amazing volunteers from the primary school, the P&C, community aid and volunteer bush fire. The festival, held on the 1st weekend of February, was the 34th annual muster and the line-up for the weekend’s entertainment made for a great two days of entertainment. Campers arrived at the showground from Monday for a full program of events for the week leading up to the muster and enjoy Bungendore and its surrounds. 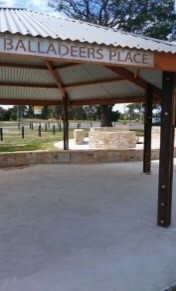 This year saw three new bush balladeers inducted into the Bush Balladeers Place which is located in the Bungendore Park. The ceremony held on Friday afternoon at Bush Balladeers Place recognised the outstanding contribution made by Owen Blundell, Keith Jamieson & Ernie Constance to the Australian Bush Balladeer industry of Australia and the Bungendore Country Music Muster over many years. The festival weekend kicked off on Saturday morning with the Signflair busking competition held in the streets of Bungendore. With more than 20 entertainers and a large numbers of voters it was a great contest. The people’s choice winners shared $1000 in prize money with David & Anne Bell with Barry Boyle in 1st place, Sam Lovell & Ginger Cox in 2nd and Danny Stubbings & Jerikye Williams in 3rd place. The judge’s award went to Gus Helm winning a spot on the muster stage along with Louise Bowerman who was this year’s winner of the pre muster walk-ups. Back at the showground the entertainment kicked off on Saturday afternoon with a an afternoon concert opened by Peter Coad and the Coad Sisters band who remained on stage to support a great line-up of entertainers including Pete Denahy and Rodney Vincent, joined by Owen Blundell, Keith Jamieson, and Ernie Constance, Di Lindsay and Peter Simpson, Justin Standley, Brian Letton, Jed & Trudy Hintz, Terry Gordon, Alisha Smith & Kate Daniel. The Stan Coster Memorial Bush Ballad concert & presentation of awards followed with the 2019 finalists performing their winning entries backed by the Bungendore Muster Band led by Lindsay Waddington. Congratulations goes to all the artists for their wonderful performances. The entertainment returned to the festival stage on Sunday morning for the Gala Concert with eight hours of non-stop entertainment from the Stan Coster award winners and guest artists. 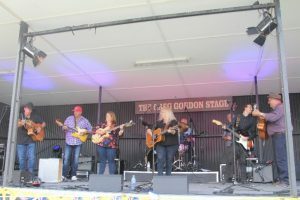 Bungendore turned out the most perfect weather for the large crowd of campers and locals who enjoyed a great show celebrating Australian country music, aussie comedy and musicianship. The muster will be celebrating 35 years next year and plans are well underway for what will be an event not to miss. The muster weekend will be on February 1st & 2nd and as usual gates will open on the Monday before the weekend for campers to setup early and enjoy a week of pre muster events and entertainment. Looking forward to seeing everyone there for what will be a fantastic celebration of 35 years.